I'm not gonna lie, I'm a food lover for sure! 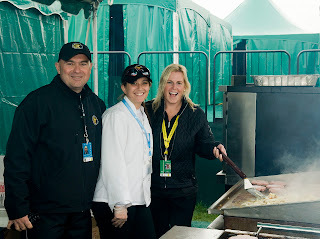 Ergo, I've always wondered just how all the food is put together at a PGA Tour event. Vince Farrar, the Director of Food and Beverage here at the Turning Stone Resort was more than happy to fill me in on the process! He took me on a wild ride around the food stations out on the Atunyote Golf Course - it was raining of course but we braved the conditions, I mean if the Tour players can deal with it, so can I! Vince was throwing all sorts of facts and figures at me and boy was I having a hard time keeping up 'cause it's really hard to even tally up my daily calorie stats, not to mention what he's got goin' on! Each day here at the golf tournament, Vince is in charge of providing breakfast, lunch, dinner, snacks and beverages to 1100 Volunteers, 500 Staff Members, about 75 Media in the Media Center, 132 PGA Tour players and their families, 12 Hospitality Suites and Villas, Spectators, all of the Vending Carts and lets not forget the 22 Restaurants at the Turning Stone Resort and Casino! Vince told me that the "Volunteer's Tent, where they feed the 1100 volunteers during the tournament, is ranked #1 on the PGA Tour!" How kool is that? He also said that "the Atunyote Golf Course is the least played course on the PGA Tour, so when the players arrive, it's usually in superb condition!" Now if only the fickle weather would cooperate! Thanks for the gorgeous sushi Vince!